Prices of green vegetables have shot up significantly in local markets as its supply is witnessing a drop these days. With mercury level raising every passing day, the arrival of green vegetables in the local markets is going down eventually pushing up prices of coriander, methi and others varieties. Coriander price recorded the highest jump during the period as it was sold at a price of Rs 60 - Rs 80 per kg in the wholesale market on Monday. It was available at a price of Rs 30 per kg about 15-20 days back. Price of Methi has also gone up following corps in many areas squeezed due to hot climatic conditions. It was sold at a price of Rs 30 per kg on Monday against it previous level of Rs 15-20 per kg in the wholesale market. Spinach is also passing through similar phase as its price has doubled during the period. It has jumped a level of Rs 10 per kg on Monday from Rs 5 per kg. Prices of green chillies are also buring a deep hope in buyers pockets. It was available at a price of Rs 40-50 per kg as compared to its previous level of Rs 20-35 per kg. Apart from green vegetables, brinjal and lady finger are also spoiling the budget of home makers. Prices of lady finger jumped by Rs 10 per kg from Rs 40 per kg while brinjal has added Rs 5 per kg in recent past. Brinjal was available at Rs 10 per kg but on Monday it went up to Rs 15 per kg in the wholesale market. In the meanwhile, Shimla mirch, beans, cucumber and parval prices have not yet seen any hike. 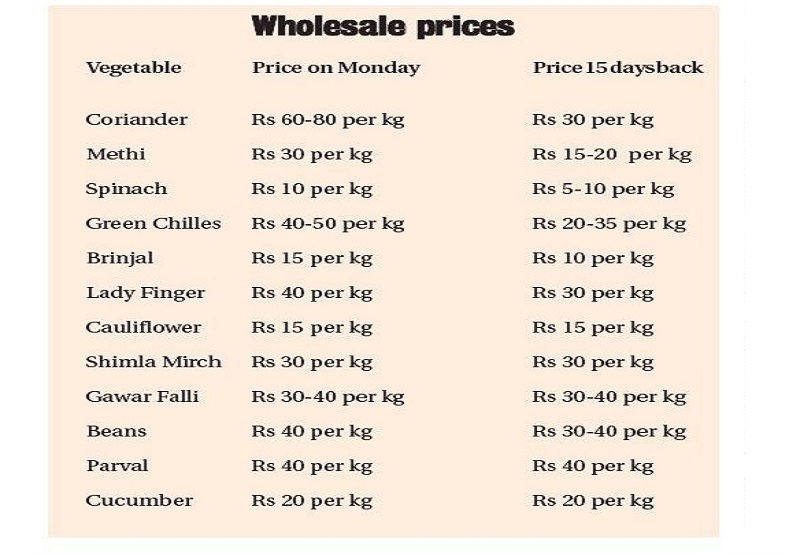 These varieties are being sold at same price for the past 15 days. Ram Mahajan, one of the leading vegetable dealers based in Phule Market and office-bearer of the dealers’ association, said prices of green vegetables have started going up. “Here onwards we will see price rise. It is very normal in summer when availability of green vegetable is affected. The situation will become further worrisome in peak summer,” he said. “Many farmers in the region avoid cultivation of green vegetables in summer and thus we are mainly dependent of farmers based in other regions. And whenever we get vegetables from far off places, the rates are on the higher side,” he explained.